While my DIL took the girls to Kindergarten Orientation one morning the week before school started, I took the boys to the playground close by. If you cross the field, there is a creek below. We enjoyed the bright morning light shining on the spiderwebs, and they posed for a picture. This is the creek that hosted all of the Canadian Geese and later on their babies, in the spring and early summer. Back then I would just see one or two ducks but many geese. This reminded me of that time. My youngest son had posted this picture from his phone on Facebook of the duck’s eggs by the pine tree in his yard. He lives close to the park. A few days later, I went down to visit nesting Mama Duck. Had I not known from him that she was under the large pine tree I’d have never seen her. As it was, I walked around the tree twice before finding her in this cleverly camouflaged nest. Can you see anything? She just stayed there quietly while I took a few pictures. I marveled at her composure. I did not try to get too close, nor try to touch her but surely she was afraid or apprehensive at my presence? Yet she stayed the course, and stayed on her eggs. As I was snapping photos of her I kept thinking of virtues such as humility, patience, perseverance, and faithfulness. Humility because while her Mallard duck spouse is garbed in brilliant colors she is plain. Her clothing is plain because of her purpose…which is to be able to fulfill her mission, safely camouflaged in order to do so. Looking at her I was reminded of human beings who work behind the scenes selflessly, or anonymous donors, versus the sort of people who get more attention due to their fine feathers. As to patience, perseverance and faithfulness, there was heavy machinery clanging not too far away, a train going by in the distance, and then this strange human circling the nest taking pictures. She made me think about how blessed the animal kingdom is, when you consider it. She’s got an inner programming to sit on these eggs and protect them. She’s got an instinct and intuition to rely on that tells her to stay there because I am harmless and mean her no ill will. Now were she a human, just sitting there on the eggs and praying…God would tell her “it’s ok…this is not a situation that you have to worry about, such as a raccoon coming along. This is just some harmless lady. ” And then, being human, she’d say ” OH God spoke to me! But wait, no…that was probably just my imagination. And I’d be crazy not to worry…what if? And what if this, and what if that, and oh I just remembered something else to worry about and of COURSE God wouldn’t really answer me…what was I thinking! I must be nuts. I am not some saint that God would really answer.” And pretty soon she’d be shaking and a nervous wreck or fighting within herself between the several voices going on in her all-too-active mind. Mama Duck had none of this turmoil. She had the “peace that passeth understanding ” and I probably learned more in spending 10 minutes with her than in reading 10 books about that. I need to remember Mama Duck every time I worry about something, give it to God, and then take it right back to worry about again. I need to remember Mama Duck every time that I consider words such as trust, and peace, and phrases such as staying the course. Back to the world of human beings and growing boys. Even though they’d had their breakfast, I was informed, after being at the park for 45 minutes or so, that they were starving. We came back home and they had a ‘second breakfast’ consisting of sandwiches, which was their request. And amazingly enough, in two hours time, they were hungry for lunch as well ! You might also enjoy: Cooking Frugally Around Sales or Who Owns This House? End of August : Applique, Etc. Early in the week, I worked on this : at one point, I’d decided to just call this a finish, and quilt it down the line as a wall hanging or display piece. This week I added a thin red border all around, and then appliqued some of what I’d made so far into a wider one for one side. 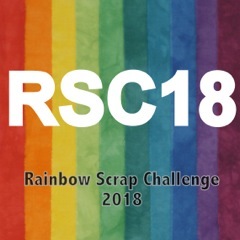 Mid-week, I decided to join Angela’s rainbow scrap challenge. I’ve seen Kathy working on orange peels here and there, but in a recent post she showed her progress, and that inspired me. August’s colors were indigo or dark scraps. I made a few blocks. Then I kept thinking that if I got bored with them, or wanted to use a color of the month for something else, why not have something else going. Seriously, I am showing this because I cut out enough for one block on Saturday. On Saturday I decided to get that ready, get another round of orange peels prepped, and at least get started on the next Rose Applique block. For the Rose Applique, I’d only had a few flowers prepped…I sewed 3 together and got started on the block. While I was at the ironing board fooling around with stems, I prepped some more circles for flowers, hexies for the stars/ spools medallion quilt, and another set of orange peels. There’s leaves and such to do but it’s a start. For Slow Sunday Stitching I have quite the choice…hand quilt ( almost done with that ) or this or that project shown above, but I think that I’ll concentrate on more Orange Peels while I am so enthused about them. The ones that I made earlier in the week are HERE. There is a 2nd-grader’s football game in the middle of the day on Sunday and a JoAnn fabrics store close by the game location. I don’t need anything but one or two thread colors. Can I visit that store after the game and only walk in and out with what I need? Hopefully…. Meanwhile when I contemplate going to a grandchild’s football game, it seems as if it was just yesterday that I was sitting on the bleachers watching my sons play football!